Frankly, "nasty buggers" could describe a lot of things -- and a lot of people -- but I'm going to stick with one topic: Ticks. Yup. I have arrived in Delaware on my "Grand Adventure" just in time for one of the worst tick seasons in the area. And I am learning more than I ever wanted to know about these nasty little buggers -- as are my poor pups. 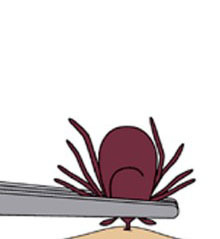 Ticks are small bloodsucking arthropods and are composed of two families, Ixodidae (hard ticks) and Argasidae (soft ticks), that each contain different genera and species of ticks. Ticks are the leading carriers (vectors) of diseases to humans in the United States, second only to mosquitoes worldwide. It is not the tick bite but the toxins, secretions, or organisms in the tick's saliva transmitted through the bite that causes disease. Two families of ticks, Ixodidae (hard ticks) and Argasidae (soft ticks), are important to humans because of the diseases or illnesses they can transmit or cause. Hard ticks have a tough back plate or scutum that defines their appearance. The hard ticks tend to attach and feed for hours to days. Disease transmission usually occurs near the end of a meal, as the tick becomes full of blood. Soft ticks have more rounded bodies and do not have the hard scutum found in hard ticks. These ticks usually feed for less than one hour. Disease transmission from these ticks can occur in less than a minute. The bite of some of these ticks produces intensely painful reactions. Outbreaks of tick-related illnesses follow seasonal patterns (about April to September in the U.S.) as ticks evolve from larvae to adults. Mild winters with an early spring often result in a high number of ticks and an increased frequency of the diseases they transmit. Ticks live and hide in low brush; this location allows them to physically contact a host. One study suggested that leaning against a tree or sitting on an old log was the quickest way to acquire ticks (about 30 seconds) in tick-infested areas. Ticks require a "blood meal" to grow and survive, and they are not very particular upon whom or what they feed. If ticks don't find a host, they may die. Once a tick finds a host (such as a human, a pet dog or cat, a deer, or a rabbit) and finds a suitable site for attachment, the tick begins to burrow with its mouthparts into exposed skin. Tick mouthparts are barbed, which helps to secure them to the host. Often the tick secretes "cementum" to more firmly attach its mouthparts and head to the host. Ticks may secrete or regurgitate small amounts of saliva that contain neurotoxins. These nerve poisons cleverly prevent the host from feeling the pain and irritation of the bite. 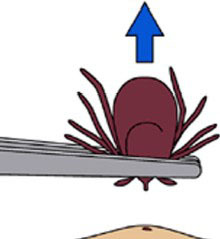 Consequently, individuals may never notice the tick bite or its feeding. The saliva may contain a blood thinner to make it easier for the tick to get its blood meal. Some people are allergic to these secretions and may have a quick and severe allergic reaction to a tick bite; a few may develop other symptoms listed below. And perhaps most important is how to remove the tick, the most fun of tasks. If you find a tick attached to your skin, there's no need to panic. There are several tick removal devices on the market, but a plain set of fine-tipped tweezers will remove a tick quite effectively. Avoid folklore remedies such as "painting" the tick with nail polish or petroleum jelly, or using heat to make the tick detach from the skin. Your goal is to remove the tick as quickly as possible--not waiting for it to detach. If you develop a rash or fever within several weeks of removing a tick, see your doctor. Be sure to tell the doctor about your recent tick bite, when the bite occurred, and where you most likely acquired the tick. Another fun resource? The Tick Encounter Resource Center website, from the University of Rhode Island. Or there is the website from WebMd. Or, if you prefer a government resource, you may check out MedlinePlus website from the National Institutes of Health. As really, isn't it all about being fully informed? Well. Consider this Public Service Announcement over. And um, yeah. I don't know about you, but I have the creepy crawlies again from pulling up this research. "How to Live Unhappily Ever After"